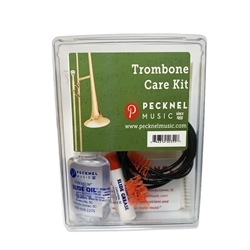 The Pecknel Trombone Care Kit offers players everything they need to care for their instrument. Contains premium slide oil, tuning slide grease, mouthpiece brush, flexible bore brush ("snake"), polishing cloth, and case i.d. tag.